Katharine Hodikoff was admitted to Morningside Hospital from the Aleutian Islands on October 6, 1913. Her diagnosis was, “acute mania, irritable, resentful, improved, inclined to suicide, industrious, fair physical condition.” She apparently improved over time, so much so that she was discharged in August 1916. 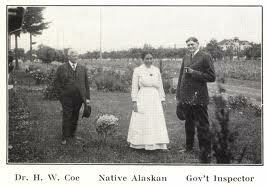 A few days before she left Morningside, Dr. Henry Coe, the president of the Sanitarium Company, informed the Department of the Interior of her release. In the letter, he described her as, “strong, vigorous, active, cleanly, and the most capable Eskimo woman I ever saw.” He goes on to say that she will be leaving with a baby named Mary McLoshkin (apparently born at Morningside?) who she adopted. You can read the [download id="53"] here. Coe notes that Katharine was in a photo with him and a Department of the Interior inspector (above, from the Library of Congress). He also wrote that she made fine baskets. I believe that this is a photo of one of her baskets. 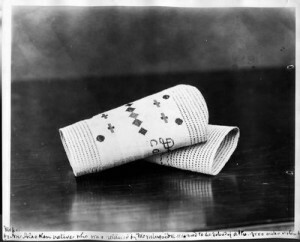 The caption under the 1916 photo (from the National Archives II) reads, “Made by an Alaska Native who was returned by Morningside to the island of Attu, 4000 miles distant.” Dr. Coe ends the letter with, “I am going to write up her story, one of these days. It is stranger than fiction.” I wish he had. I’ve checked many sources but can find nothing on Katharine after her discharge from Morningside. Please leave a comment if you know more about her or her family. This entry was posted in 1900-1929, Patient Photos, Patient Stories, Photos. Bookmark the permalink. Post a comment or leave a trackback: Trackback URL. I’m doing my daughter’s geneology which includes natives/Russian in the Kuskokwim area.